The time: six months prior to the launch of the U.S.S. Enterprise 1701-B and the tragic loss of Captain James T. Kirk in deep space. The place: Earth, where the galaxy's most renowned hero must face the spectre of retirement. But Kirk's path takes an unexpected turn when a mysterious woman offers him an irresistible adventure - a voyage to an uncharted planet where he will confront the ultimate threat to the peace between the Federation and the Klingon Empire, and the ultimate temptation - a chance to recapture his youth. This story by Shatner is interesting mainly because if takes place in STOS time and fits in well with the TV show. 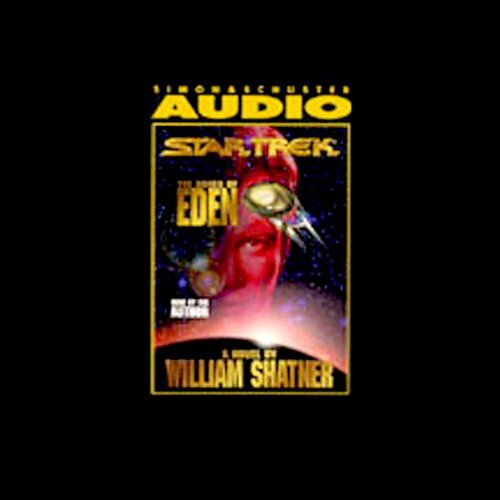 The story plays out like many ST novels and works well with Shatner's reading. 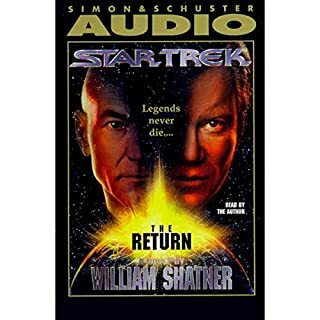 As a fan of STOS novels I have been wanting to read Shatner's work for a while, and this book did not disappoint me. All of us who were thrilled by the escapades of the crew of the USS ENTERPRISE remain so to this day---but what about the "side escapades" of those crew members? what adventures did they encounter when they were not on the ENTERPRISE? Shatner gives us a "behind-the-scenes" look into what transpired with him & his crew that expands the Star Trek universe exponentially & also how the actions of those involved do make an impact on the shaping of what I would call "Universal Destiny". "The Ashes Of Eden" takes us on that journey during the "Generations" story & tells the "side escapades" of Cap't. Kirk from the viewpoint of one who knew him best---Spock. I enjoyed this sideline story immensely & would encourage all to acquire the sideline stories to the main stories of the Star Trek Universe & to "Boldly Go---Where We Have Yet To Venture". Awesome with Kirk Narration, too short though. Good story, great with Shatner reading it, and nice ending for a beloved friend. Wish it was longer though. In the end, I enjoyed it and that's all that matters. Shatner is the coolest man on the planet. This is a great dramatization. The sound effects are superb! 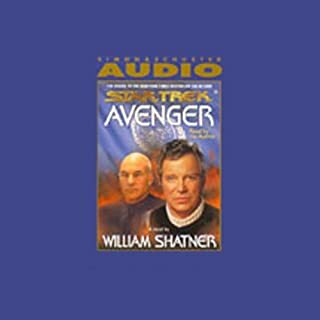 Chekov's Russian accent was a little of, but it did not detract from the enjoyment of this mini audiodrama. Star Trek at it's Best! having been a fan of Star Trek since it began so many years ago, this story captures the essence of what Star Trek is all about!. Having it read by William Shatner and hearing his voice again, takes it to the next level. Highly recommend this book! 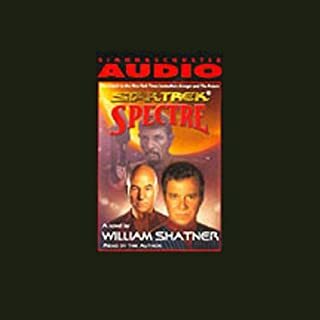 The audio version is tremendous with special effects and storyline, I have listened to it several times. 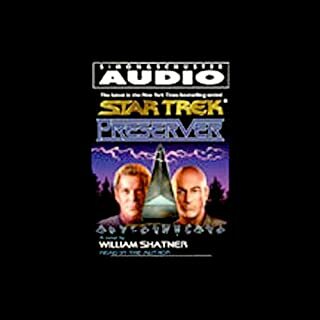 Can't get enough of Star Trek .... another great story and reading by the Captain. AN UNBRIDGED VERSION NARRATED BY WILLIAM SHATNER WOULD BE AMAZINGLY AWESOME!!! PLEASE PLEASE PLEASE!!! THANK YOU!!! I often wonder listening to Shatner Star Trek stories if the man has not entirely forgotten that Kirk is a work of fiction? This is a good story though, with all the old favorites and no great knowledge of Star Trekkiverse needed. Enjoyed listening to it. You imagination soon takes over and fills in the images. Shatner is a good writer of this stuff to give him his due. shatner never fails to deliver! Yes. 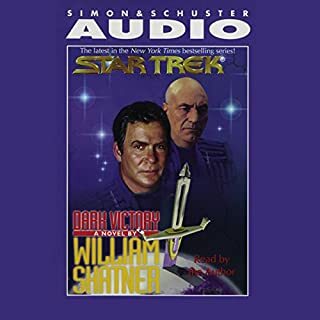 The story itself is a lot of fun, Shatner gives an excellent (and typically theatrical) performance, and I thought that all the music/sound effects worked great in creating a very "Star Trek" experience. It can get a bit ridiculous how Shatner writes Kirk to be this borderline psychic genius, able to pilot a starship on his own, beat up Klingons and bed any woman he wants when he's supposed to be 60+ years old, but I thought that just added to the fun. Chekov, because of Shatner's hilariously terrible impersonation of Walter Koenig. Have you listened to any of William Shatner’s other performances? How does this one compare? It falls somewhere between 'How Insensitive' and 'Lucy In The Sky With Diamonds'. 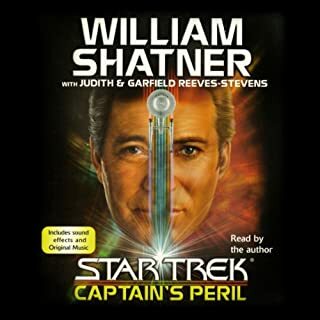 I'm sure there are some aspects of the book that would make die-hard Trekkies' heads explode, but I would suggest that you just go along for the ride and enjoy the story. Also, oddly enough, the story did at times remind me of the plot for Insurrection, even though I think the book was published a couple of years before the film was released. Great stuff from Shatner, but the story itself, sums up Kirk, in both his weaknesses and his strengths. Worth a listen!